Here’s the situation: A few weeks ago, Jaya was dining at an airport in North Carolina, waiting for her plane home. A man and a woman sat down two tables over, and ordered drinks and burgers. 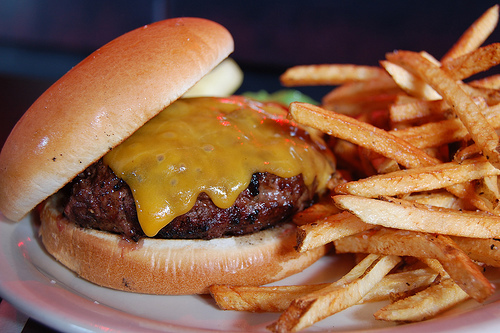 When the food comes out, the guy notices there is no cheese on his burger (he ordered a cheeseburger) and asked the waitress to bring him a slice of cheese. She did, but he complained that the cheese looked like it had come off another burger. She explained the chef had warmed it up so it would be a bit melty, but he refused to eat it. Meanwhile, he ate his entire burger, drank two beers, and then left the restaurant to get a Snickers bar, which he ate at his table. This, he explained to the table in between us, was because he was “worried any dessert here would come out half-eaten.” When the waitress came to see if they needed anything else, he said “just don’t charge me and we’ll be fine.” All the while he was badmouthing the waitress to people at nearby tables. Jaya: Basically, I feel like yeah the waitress messed up and wasn’t the most attentive, but this guy was worse. Victoria: I think for a food order that is wrong, often a restaurant will comp just that order even if you ate it. But definitely not the whole bill. I don’t think you can even really ask for your meal to be comped—the restaurant has to offer it. Jaya: There have definitely been times where someone messed up my order and offered to comp—but that was maybe when I was brought entirely the wrong thing, or it was really slow. Victoria: Right. Here, they tried to fix the problem. And I think, if they are trying to fix the problem, and it’s not to your satisfaction, you need to ask for a manager, because they can deal with it much better. The worst is when you are annoyed with the service or your meal comes out wrong and you never say anything, you just don’t leave a tip. Come on! SAY something and get it resolved. Jaya: Yes! I hate that. Most of the time these things are honest mistakes, and can be resolved quickly. After my brief stint as a waitress, I’d always rather people let me know what was wrong. Sometimes it was a busy night and I forgot to put in an order! Or put it in wrong! But telling me or a manager first means we can expedite something to you, instead of you remaining miserable. Jaya: Also I thought with this guy that the bringing in outside food was extra-rude. Yes, service wasn’t great, but you don’t have to do that. Victoria: Yes, and actually a lot of restaurants don’t allow it because it is a “health hazard” and can get them in trouble. Jaya: And if it was really that bad, don’t order that second beer, pay your bill and just leave. It just bothered me so much. It took this unfortunate, but by no means uncommon or devastating, situation and just made it worse for everyone. Victoria: Seriously, get some perspective, rude person. Jaya: Like, ok, you didn’t get cheese on your burger. You’re at an airport, not date night. Just eat and get on your damn plane. Victoria: Hahah yeah, and it’s not like they put cheese on it when you specifically said you are allergic and will die if cheese gets near you. Jaya: Exactly! It was also interesting with this guy, that he didn’t send it back and ask for a cheeseburger, which would have been reasonable. He asked for a slice of cheese to put on the burger and I think asked for them to warm it up, so then was just mad that they did what he asked? Like, if they just brought him a slice of cheese as their solution, that would be weird, but that’s what he asked for. Victoria: Yeah, that is insane. Or if he hadn’t bitten it yet, they could maybe take it back, put the patty back on the grill with some cheese and it would be fine. Jaya: It was just his general attitude that bothered me. He kept talking to the people at the table in between us about how ridiculous service was, and joking about his snickers bar, etc., and it just wasn’t, for lack of a better term, classy. Victoria: Always be classy. I think complaints should be made quietly and without fuss. Just like, this is my problem, what can we do to correct it. Jaya: Yes, absolutely. and you don’t need to show attitude unless the waitstaff shows it first. But his waitress was clearly trying, so there’s no need to badmouth her to other people or bring in outside food. Victoria: Right, it the staff gets snotty and rude, its a bit more understandable, but you still should take the high ground. I was at a restaurant recently and ordered a salad as an appetizer since I wanted something light and healthyish. As I was eating I noticed a ladybug in my salad. I pointed this out to the waitress, who profusely apologized, and I asked if I could have the veggie egg roll, instead. When she brought out the check at the end of the meal I noticed that while the salad had been comped, but the replacement appetizer had not. I had assumed it would be, but was unsure if I should complain to the manager in order to get the appetizer that I hadn’t really wanted taken off my bill. Should I have made more of a fuss? I think if the waitress had brought you another salad or appetizer on her own accord, it would be strange if they charged you. But since you ordered the veggie roll and (I assume) ate it and it was fine, there was no reason that needed to be comped. I mean, it would have been nice, but also comping seems more like a nice thing a restaurant can do to make up for poor service than something one can demand, especially if one has continued to eat the meal. Restaurant workers! Does your restaurant have an explicit protocol on when and when not to comp customers? How do you judge what’s appropriate?